A little while back I had the pleasure of working with an absolutely stellar team of ladies on a styled photoshoot. The lovely Briar of Epic Events asked me to come on board to provide the florals for the shoot, and when I saw the mood boards she had put together with the team from Culinary Capers (the fantastic caterers that provided the location and the delicious food for the shoot) I couldn’t refuse. The vibe was fresh, garden-like, elegant yet relaxed. Basically all of my favourite things. The colour palette was simply whites and greens, which is always nice to work with, but otherwise I had quite a lot of creative freedom to create whatever I thought would work and compliment the rest of the decor. I must say it was refreshing to have that creative freedom, I have brides give me quite a bit as well from time to time, but I still always feel a bit of pressure, I mean it’s someone’s big day and I would never want them to be disappointed. Now of course I didn’t want to let this team down either, but just knowing that I was allowed to totally do my thing was magical, I really think it lead to great results! The bridal bouquet might be one of my favourites I’ve made to date! 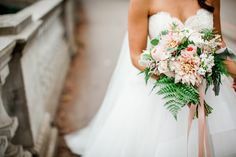 It looks lovely with the gorgeous dresses that were provided by Everly Fine Bridal, and the delicate jewelry by Keltie Leanne Designs. Some of the other vendors included vintage decor from Bespoke Decor and rentals from Pedersens, a beautiful stationary suite from Violet Grey Creative, and the team behind beautifying our model/bride was Save the Date Beauty. As I mentioned Culinary Capers provided a delectable spread included the cakes, and we shot at Waterview Special Event Space, which has amazing views of False Creek. And last but certainly not least, our wonderful photographer for the day was Jen Giles of Blush Sky Photography! She is one talented lady, the photos below speak for themselves! I am also happy to say all our hard work paid off, this shoot was featured on the Real Wedding blog! So without further ado, see the photos below! 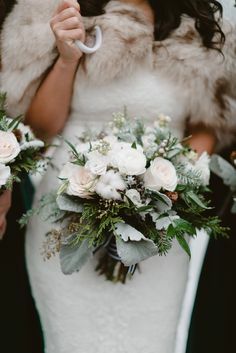 If you have ever considered having a winter wedding, this one might just tip the scales from maybe to definitely yes! Angela and Dario got married last December, and I had the pleasure of creating the florals for their big day. Angela had a pretty clear vision for what she wanted but she also was happy to allow me some creative freedom to do my thing and build upon her initial ideas, which basically made her a dream client! The wedding date was December 19, 6 short days before Christmas so we wanted to make sure that the florals said “Winter” not “Christmas”. We worked with lots of evergreens and stuck to whites, creams, frosty grey and even a little navy blue in the colour scheme using, roses, ranunculus, lisianthus, cedar, fir, cotton blooms, succulents, dusty miller, brunia, and privet berries. The muted colour pallet was really brought alive by all the different textures mixed together. A common way to save on costs is to try and re-use certain items throughout the day, we were able to do that by re-using the cedar wreaths made to hang on the pews at the ceremony as some of the centrepieces. For the reception we laid them flat on tables, added a few succulent blooms and had cylinder vase with floating candles placed in the middle. They had quite a few tables so we mixed it up by doing the wreaths on 1/3 of the tables, another 1/3 had a collection of bud vases with evergreen woven through them, and the last 1/3 had a more substantial floral piece in a mercury glass pedestal vase. The head table was framed by a soft flowy draped backdrop edged with a cedar garland. The rest of the reception decor included lots of warm whites and creams accented with gold, creating a warm and inviting scene for their guests at the Roma Hall in New Westminster. See a few photos below and check out the full gallery of absolutely gorgeous images by M and Him. Well I’ve done it. I have taken the leap and finally moved from working in a studio/warehouse space to an ACTUAL store front. It was quite the process. Finding a spot was half the battle but I managed to find a tiny little spot in the lovely neighbourhood of Kerrisdale that fit the bill but was in need of some serious TLC. Now I have watched A LOT of home reno shows on tv, so I should have known that there were going to be some road blocks/hiccups/minor disasters when fixing up an old space. And I certainly had a few of those, but with the help and support of AMAZING family and friends and actual blood, sweat and tears (lots of tears) we managed to pull it together. I had a vision of what I wanted the finished product to be, and I think I came pretty close to what I hoped for. With a limited budget and the constrains of the building it was a bit tricky, but I wanted charming, I wanted character, I wanted cozy, and I wanted it to feel like a place the neighbourhood would embrace. Somewhere I could fill with fresh flowers and feel inspired to keep creating. A place people could pop into an pick up blooms, and a place for brides to come and have a cup of tea and chat about their vision for their wedding florals. With the changing landscape of the city, and the move towards tearing down old buildings in favour of shiny new ones, it was difficult to find something that would be embedded in a neighbourhood and be a place that could fulfil that wish list of mine. However I think I managed to check all those boxes with my little shop around the corner. I officially opened September 15, 2016 so come on by to pick up fresh blooms, or call in to place a special order, or just stop by to say hello! The address is 2018 West 45th Ave, I hope to see you soon! I love teaching workshops. I love them for a number of reasons, like that it often gets a group of people into a room together who wouldn’t normally get together, or it brings a group of friends together doing something they normally wouldn’t do. But mostly I love them because it gives people an opportunity to make something. I take for granted that my job allows me to make things all day long. 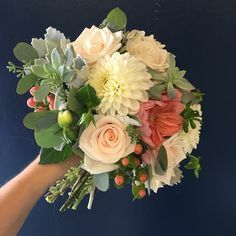 There is a certain satisfaction that comes from making things with your own two hands; whether it be baking a cake, cooking a meal from scratch, building a birdhouse, or in my case making flower arrangements and bouquets. We start out in life making things all the time. We build towers of lego, draw pictures, sculpt play dough, make telescopes out of empty toilet paper rolls…ok maybe that last one was just me. But somewhere along the way a lot of us stop making things. I see people come in and look at all the materials laid out on the tables, in this case it was lots of evergreens, berries, wire and wreath forms. The eyes get a bit wider and almost every time someone says something like, “Oh this looks wonderful, but I don’t know if I’ll be able to do it! Is it hard?” As we go along and I start to show them what to do someone also says “Well you make it look so easy!” But they start cutting and bunching and wrapping with wire, and some have trouble and some get the hang of it quickly. Without fail though, at the end EVERYONE stands there marvelling at their creation, some in slight disbelief that they actually did it. I see them smile and feel so proud of themselves, and that is my favourite moment. No two creations look the same, even though they had the very same materials to work with, each one as unique as the person that made it. I know that everyone isn’t going to walk away from the experience and decide to start crafting/baking/building up a storm, and that’s ok. It might be the only thing they make all year long, but I helped them do it, and that is why I love teaching workshops. I had a lovely photography student Christie Wood, from Emily Carr, offer to come and capture the fun on night 2 of the workshop. Thanks for coming and snapping away Christie! The holiday season is just about upon us. To kick things off I am teaming up with the girls at Kiss and Makeup in their newest location in the Olympic Village to host an evening of floral fun! Come join us and learn how to create your own one of a kind wreath featuring succulents and evergreens. Once you are finished creating your masterpiece, you’ll want to get out a pen and paper and get a jump start on your Christmas wish list! The store is chock-full of pretty things! Everything you need will be provided along with snacks and drinks. It’s a fun event, and all skill levels are welcome! Despite the fact that the sun is indeed shining, summer seems to be officially over. Which for me means a slowing down in the world of wedding flowers. That being said, I kind of love a good fall or winter wedding. I featured Ashely and Steve’s wedding on here a while back, I worked on that around this time last year. 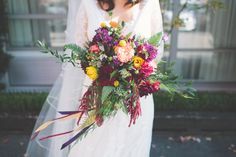 But today I want to share some beautiful images taken by the amazingly talented Shari + Mike of Shari + Mike Photographers . They have kindly shared with me the photos from a wedding we worked on last winter. It was on December 27th at Lind Hall on Granville Island. Which is consequently where I will be doing a wedding this weekend. Hoping to get images of that wedding too as it is going to be a super fun colourful affair. Check back for those later. Back to this winter wedding…the bride and groom wanted to capture an essence of the season without having it be too Christmasy. 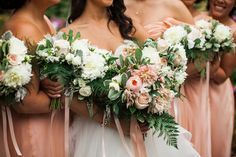 They stuck to a pallet of whites, creams, and greens, and greys with the bridesmaids dresses giving a pop of muted blush. It was elegant and sophisticated, but the evergreens and warm woods used gave it a bit of a rustic twist. I love working with cedar, it lays so nice and flat on tables, lasts forever and of course smells delightful. 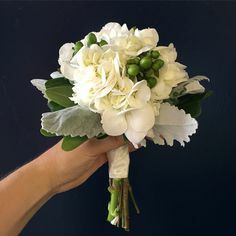 The bridal bouquet along with the bridesmaids had an elegant, clean, compact look, but had some cotton blooms and grey brunia berries added in to give it a little bit of that woodsy charm that was happening in the rest of the decor. So without further ado, have a look at these stunning photos of Stefani + Zameer’s winter wedding. Here’s a little re-cap of the Mother’s Day workshop I hosted along with the folks at Old Faithful. We had a great group of lovely ladies come and join us for some flower fun early on a Sunday morning. We started off the morning with mimosas and croissants, then it was on to watching me give a quick talk and demo of the arrangement. After that they were off to the races! Everyone got to dive in and choose their ingredients from a selection of Peonies, Stock, Tulips, Sweet Peas, Viburnum and various greens. I had outlined a little recipe for everyone to work from. Here are a few photos of the morning. It is always so great seeing how everyone’s arrangements come together, there weren’t 2 that looked alike! Thanks to Courtney from Old Faithful for snapping these and sharing them with me! Super excited to announce I will be teaming up again with the fine folks at Old Faithful to host a Mother’s Day workshop!! Come learn how to make a gorgeous English garden style arrangement using fresh seasonal blooms. 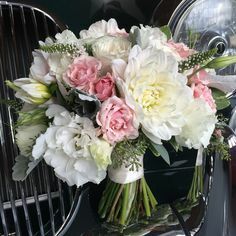 Mothers always love something made from the heart, so step it up from those hand prints you used to give her back in the day, and present her with a lovely arrangement made by you! Or make it an outing and bring Mom along, flowers + quality time with her kids is always a hit. The workshop will be held from 9-11am on Sunday May 10th. Head over to Old Faithful’s site here to get more details and sign up! Look forward to seeing you there, space is limited so you better hurry! That’s right people, spring is definitely in the air. Not only are blossoms blooming like crazy all over Vancouver, sunshine and warmer temps seem to be more the norm than rain clouds. Baby bunnies are hopping all over Jericho Beach, and on top of that a few of my very best friends have just had (or are about to have) new babies, which is seriously exciting! New life is popping up everywhere. So that got me thinking it was time for a fun spring project. I thought I would try something a little different. Back in the fall I had the pleasure of doing flowers for a lovely bride named Meghan who was getting married at the Heritage Hall on Main St. She wanted some sort of floral decor for the ceremony but wasn’t too keen on the more traditional set up of having 2 arrangements flank the “alter” so to speak. 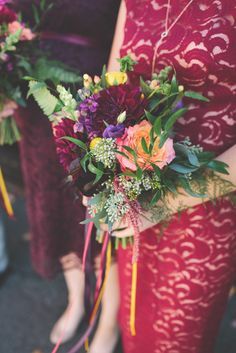 We came up with the idea of a hanging arrangement using some branches and incorporating some floral with similar colours and varieties I used in her and her bridesmaids’ bouquets. See below for the end result. Back to spring, I decided to use that same method but scale it down to create a kind of a spring wreath or wall hanging using curly willow, daffodils, ranunculus, muscari, anemones, and viburnum in a pallet of fresh spring colours. I even added a bit of my signature striped ribbon. It also turned out that it would work nicely to rest it on a mantel or even just lay it down flat. Have a look! There you go, hope spring is popping up in your neighbourhoods, wherever they might be! So I am fully aware that January has nearly come to an end, but I figured it wasn’t too late to do a bit of a re-cap of 2014. It was definitely a big year in my world. Some of my very best friends got married, including my life long BFF, who I was so proud to stand beside as her one and only bridesmaid. And now some of those same friends are expecting babies in the next few months, which is sure to make 2015 full of adorableness. I should apologize in advance, as my instagram feed will probably be littered with chubby baby cheeks in the near future. And of course 2014 was the year I started this little business of mine. It’s been a dream of mine for quite some time, however I wouldn’t be the floral designer I am today without the years spent in my last job with the great team at Garden Party Flowers. I was there for 4 years before I took the leap and decided to go out on my own. I learned so much from my time spent there. Special shout outs definitely go to Amy, Lisa and Tina. These 3 lovely ladies were a big part of my life, and my evolution as a designer. I am forever grateful for all 3 of them, and would not be where I am without them!